An infrared/optical representative-color image of a massive galaxy cluster located 7 billion light-years from Earth. This cluster weighs as much as 800 trillion suns. Galaxies with "old" stellar populations, like modern-day ellipticals, are circled in yellow; galaxies with "young" stellar populations, like modern-day spirals, are circled in blue. Images taken with the Infrared Array Camera on the Spitzer Space Telescope and the Mosaic-II camera on the Blanco 4-meter telescope at the Cerro Tololo Inter-American Observatory. 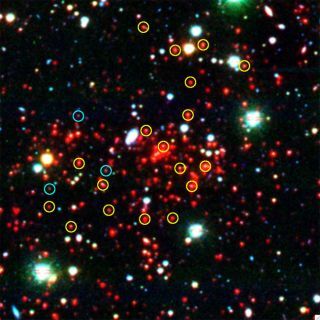 The most massive conglomeration of galaxies ever spotted inthe early universe has been found, astronomers say. This behemoth galaxy cluster contains about 800 trillion sunspacked inside hundreds of galaxies. And it's not even finished growing. The newfound cluster, called SPT-CL J0546-5345, is about 7billion light-years from Earth, meaning that its light has taken that long toreach us. Thus, astronomers are seeing this clump as it was 7 billion yearsago. "This galaxycluster wins the heavyweight title," astronomer Mark Brodwin of the Harvard-SmithsonianCenter for Astrophysics in Cambridge, Mass., said in a statement. "It'samong the most massive clusters ever found at this distance." While there are some heavier clusters in the near universe,if we could see this cluster as it is today, it would likely rank among themost massive clusters of all, the researchers said. Brodwin and colleagues reported the discovery in a recent editionof the Astrophysical Journal. The discovery could help scientists piece together the earlyhistory of our universe, as well as how strange stuff called darkenergy played a role. Seven billion years ago, our solar system ? which is about4.5 billion years old ? was not yet born. This cluster must have formedrelatively soon after the Big Bang to have amassed such a girth so early,scientists said. "This cluster is full of 'old' galaxies, meaning thatit had to come together very early in the universe's history ? within the first2 billion years," Brodwin said. These days, new galaxy clusters cannot form because of theuniverse's accelerating rate of expansion ? each galaxy is flying apart fromall others at ever-increasing speeds. This is thought to be caused by amysterious force scientists have named dark energy. Scientists think dark energy is behind the universe'smysteriously accelerating expansion, but they can't establish for sure thatthis force exists. Weighing massive clusters like SPT-CL J0546-5345 could helpastrophysicists ?pin down the nature of this odd quantity. The galaxy cluster was spotted by a new, huge 33-foot(10-meter) telescope at the South Pole, where the observatory benefits from an exceptionallyclear, dry and stable atmosphere that enables extremely crisp high-resolutionphotos. The so-called SouthPole Telescope, funded by the National Science Foundation and run byscientists at more than a dozen international institutions, is finishing up itsfirst survey of a huge swath of the sky in relatively long-wavelength,low-frequency submillimeter light. Once the survey is complete, the researchers hope to findmany more previously unknown giant galaxy clusters. "After many years of effort, these early successes arevery exciting," Brodwin said. "The full SPT survey, to be completednext year, will rewrite the book on the most massive clusters in the earlyuniverse."